For many baseball teams reaching .500 in May is not a big deal. For some it's par for the course. For others it's a bit of a disappointment. 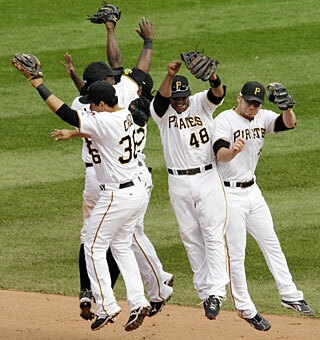 For one team, the Pittsburgh Pirates, reaching .500 is a momentous occasion. With a 5-4 win yesterday over the Houston Astros the Pittsburgh Pirates achieved a .500 record (17-17) for the first time in May since 2005. For a team who has not had a winning season since 1992, for the young core of the current Pirates to reach .500 this "late" in the year is a step in the right direction to turning around a once proud franchise. To read more about the Pirates and their past, read my old entries on the Pirates here and here. While it's easy to scoff at a team with over 18 years of losing seasons, it's even harder to imagine when you look at the historical numbers associated with this losing streak that has topped the record books for the most losing season in professional sports history. Since the 1993 season the Pirates overall record is 1232-1623 counting the current record. To put that in perspective, while it's taken since 1992 for the Pirates to win over 1200 games, the New York Yankees have won more games since 1998. 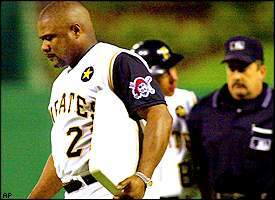 The closest the Pirates have come to a winning record since they broke up their core of Bonds, Bonilla, Van Slyke, Drabek, Smiley, and company was the so called "Freak Show" crew in 1997 that went 79-83 for a surprise second place finish in the central. That team's opening day payroll was less than the average starting amount for the Powerball drawings at $9 million. For those who are unfamiliar, or not degenerative gamblers, the Powerball Jackpot starts annually at $25 million. Since the Pirates have started their run of mediocrity one team has been moved from Montreal to Washington and four franchises, the Florida Marlins, Colorado Rockies, Arizona Diamondbacks, and Tampa Bay (Devil) Rays, have been started. All four of those franchises have been in the World Series. The Diamondbacks won once. The Marlins have won twice. From the last time the Pirates were in the post season until now 18 teams have been in the World Series, over half of the league. There have been eleven winners of the World Series. Three teams have won it more than once. The Marlins and Boston Red Sox twice, the Yankees five. The Pirates have been through six and a half managers in their time losing: Jim Leyland, Gene Lamont, Lloyd McClendon, Pete Mackanin (interim), Jim Tracy, John Russell, and current manager Clint Hurdle. Ignoring Hurdle's current 17-17 record and interim manager Pete Mackanin's 12-14 the best record of these managers was Gene Lamont, manager from 1997-2000. His 259-323 record, with a .445 win percentage is the best they've done. The worst was by far previous manager John Russell who went 186-299. That's a whopping .384 win percentage. The Pirates teams that have occupied the space between 1992 and now have been a mix of youth with no potential, vets past their prime, All Star pity selections, and a few legitimate players none of which will be entering the Hall of Fame any time soon. With bad managers, a poor front office, and ownership which is hardly generous it's not a surprise that the Pirates have floundered. This current edition, however, has promise. A solid core of young players with honest major league potential plus room to grow and the best manager they've had since Jim Leyland the Pirates look to be on the right track. The future is still a question. Will ownership pony up the cash to keep the core together and surround it with the talent it needs to be competitive? Only time will tell. Right now, though, reaching .500 in May is a step in the right direction.